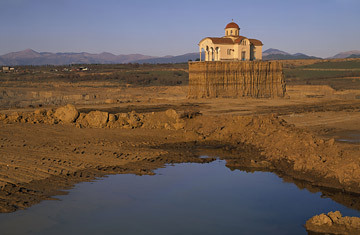 This church (pictured above), near Megalopoli in Greece, used to be part of a village. By the time British photographer Stuart Franklin visited and took the picture in 2007, work crews had leveled the other buildings and scraped out the earth to extract lignite (brown coal), used to fuel a nearby power station. The crews were too superstitious to destroy a holy place, a guide told Franklin. Far above the new ground level, the edifice is now inaccessible.